So, let’s talk about the elephant in the room. I know you’re all wondering why I failed to write a post to commemorate the very important holiday that took place last Saturday, and I’d just like to take this opportunity to apologize for skipping over such an important day in the calendar year. I’m sorry. Never again will I neglect to document the delicious events of Pi Day. Pi Day! You know, March 14th! March 14th… 3/14. As in, the appropriate number day to celebrate that mathmatical phenomenon we call Pi: 3.1415blahblahnumbersnumbersuntilinfinity. Pi! It’s a number that goes on forever. Forever! It’s going on right now, actually. This very second. …Whoa. My appreciation for Pi Day began in the sixth grade. My teachers held a contest on March 14th to see which student could memorize the most digits in Pi. A kid named Matthew won, after memorizing upwards of some 80-odd digits. I guess that’s pretty good, except when you think about the fact that it’s only 80 out of infinity. Not great percentage-wise. Of course, I didn’t get much past 3.1415, but that’s because I was distracted by pie. The dessert, not the number. I mean really, is there much of a contest? There were tables lined with pie to help celebrate Pi Day; there was blueberry, apple, peach, strawberry rhubarb… who cares about numbers when you’re staring at a table full of strawberry rhubarb pie? There was no strawberry rhubarb this year, but there was a delicious Alsatian pizza pie. I suppose pizza is a different approach to Pi Day, but I think it works just as well. This way you don’t have to wait for dessert to start celebrating. Now then, the Alsatian pizza. Charlie and I ordered one on Saturday night at Picco, one of my favorite restaurants in Boston. It came out of the kitchen piled with gruyere, lardons (a fancy way of saying bacon) and creme fraiche, and it was speckled with woodsy rosemary spears and flecks of lemony thyme. Simply put, it was superb, and it inspired me to make an adapted version for last night’s dinner – a savory Alsatian tart. Now I know that a tart is not a pie, pizza or otherwise, but I think of tarts and pies as being related. Sort of like cousins, where pie is the hearty, Midwestern, sweet yet rough-around-the-edges gal, and the tart is her sleek, elegant, slightly snooty cousin from France. I often want to hang out with pie and bask in her wholesome simplicity, but occasionally I’m in the mood to spend time with someone a bit more sophisticated. Or at least someone who incorporates more bacon. Enter, Alsatian tart. With tangy cheese, melty, caramelized onions, and crispy bacon, this (not at all snooty) tart gives strawberry rhubarb pie a run for its money. Happy belated Pi Day! A word to the wise: you will want to eat more than one piece of this tart. Don’t. I mean, you could if you really wanted to, but you may regret it. 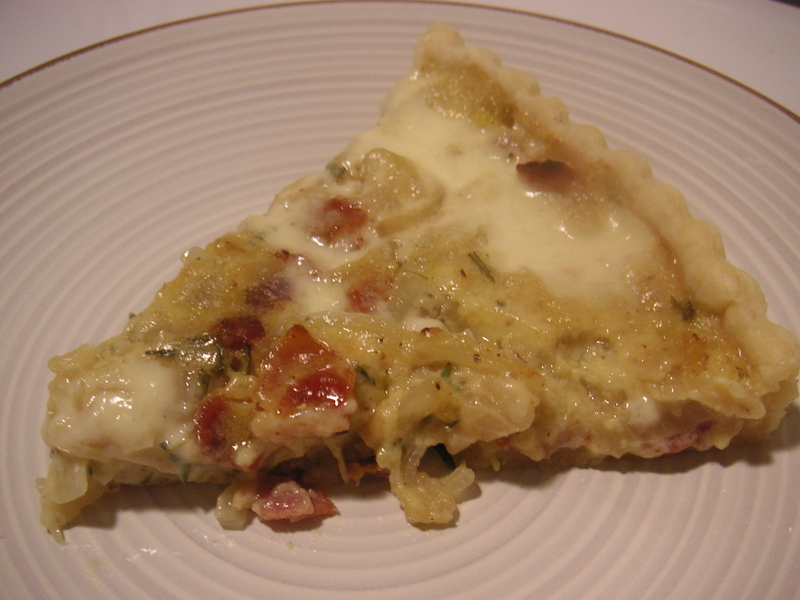 Between the butteriness of the crust, the saltiness of the bacon, the sweetness of the onions, and the creaminess of both the gruyere and creme fraiche, this is one rich tart. I had two pieces for dinner last night, and my tummy was scolding me all the way to bed. I suggest pairing one slice of Alsatian tart with a crisp salad of baby greens or roasted asparagus for a delicious and well-balanced lunch or dinner. Your tummy will thank you later. Note: You could easily make this vegetarian friendly by omitting the bacon (though you may want to add more salt to compensate for the lack of salty meat). If you don’t have a tart pan, you could use a regular pie dish instead. First, make the crust. Place the flour, salt, and sugar in the bowl of a food processor, and pulse for a few seconds to combine. Add the butter and pulse about 10 times, until the butter is in small bits the size of peas. With the motor running, pour the ice water down the feed tube and pulse just until the dough starts to come together. Dump the dough onto a floured board and knead quickly into a ball. Wrap in plastic and refrigerate for at least 1 hour. Roll out the dough on a floured board and press into the bottom and sides of a 9-inch tart pan. Cover with plastic wrap and place in the refrigerator to chill while you make the filling. To make the filling, first crisp up the bacon over medium high heat in a large saute pan. When the bacon bits are sufficiently crispy, remove them from the pan with a slotted spoon and drain them of grease on a plate covered with a paper towel. Cook the sliced onions in the remaining bacon grease over medium heat, stirring often, until the onions are very soft and lightly browned, just beginning to caramelize. In a medium bowl, whisk together the egg and milk. Add the Gruyere, rosemary, thyme, and salt and pepper to taste. Stir in the browned onions and bacon bits with a fork, until well incorporated. Pour the egg mixture into the tart shell, and dollop spoonfuls of creme fraiche on top. Bake for 25-30 minutes, until the filling is set and the tart is beginning to brown. this looks delish. well done, olivejuiced. Do you think that it would be a well balanced meal if you had a piece of this Alsatian pie, followed by a piece of, say, banana cream pie? Sometimes I feel like Michael Scott is writing this thing. And I like it. This sounds soso good! I love caramelized onions. I put some in a fritatta today and they were delish.